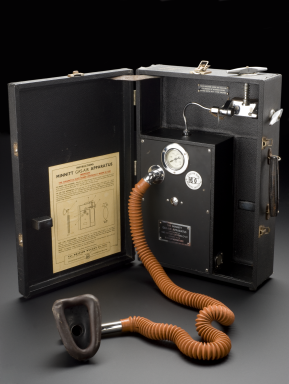 The first gas and air machine used as a form of pain relief in labour was developed in 1935. They grew in popularity after the Second World War, and in particular during the first two decades of the NHS. They allow mothers to self-administer the mixture of nitrous oxide and air and remain a popular form of labour pain relief today.